Most fun day so far!! Not without a hot (102) and difficult ascent of almost 6500 ft but the descent through Ponderosa Pines and high desert plants on a great road- fantastic! We hit speeds of 36 mph. Finally got into Prescott in the early afternoon with some spare energy. Passed through Yarnell Az. Where the 19 firefighters died in a 2013 firestorm. There is a slew of signs honoring their service. Here’s a few photos — see we aren’t eating too bad- pie for a morning snack! So awesome! Also, Been looking around in my free time out here and finally found a spare bike-I think Denise will feel safe on this one- as soon as we inflat those tires! How do you like the socks- their from Pro Compression in Carlsbad- the honking is getting outrageous. On to Jerome tomorrow -sounds like a cool old mining/ Western town and a favorite of the motorcycle crowd– wait until we blow in there!! More power to you. Thank you for including your incredible journey. Yes…..Jerome is quite the experience. Been there! The ride out of Jerome is crazy but….you know how I feel about heights! Very good! (I can’t believe they make you have those Flags on the bikes!)…. The “Haunted Hamburger” in Jerome is GREAT! And the narrow / twisty / downhills are a blast! Have fun, be safe! Jim, You’re looking good on that quadracyce (or whatever it is). 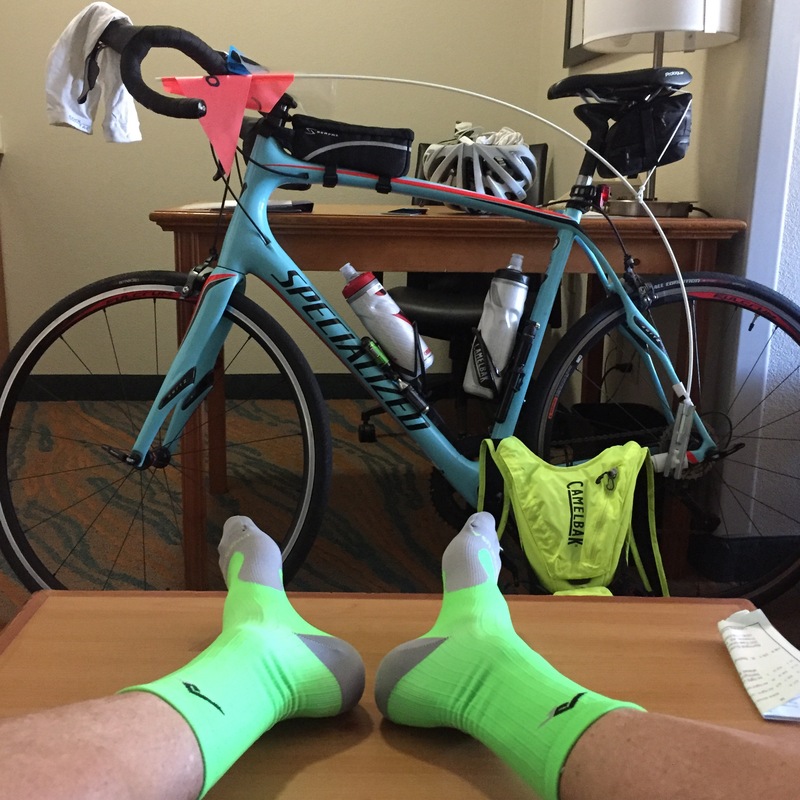 I have to get a pair of those green socks for the Schuylkill River Trail ! The ground hogs will want to take a bite out of my ankle. Press on and stay safe. 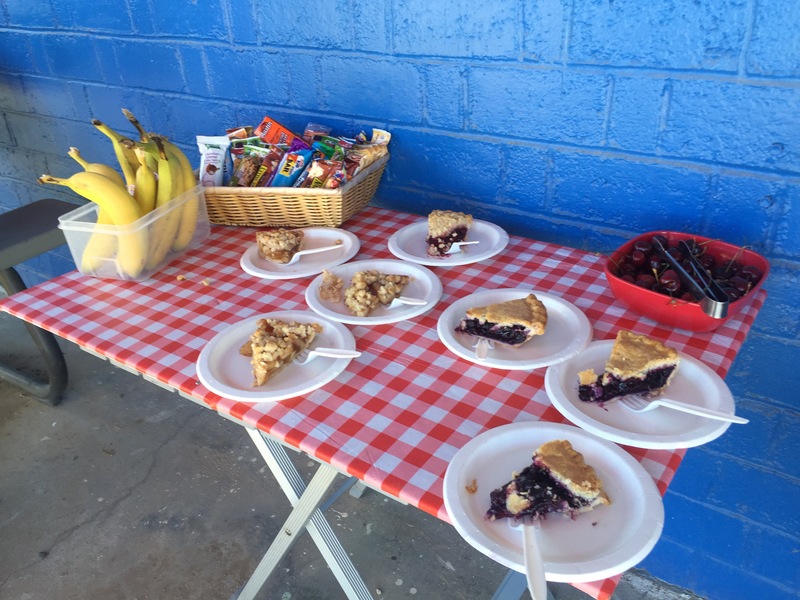 A sport where you get to eat pie for breakfast….perfect! Seriously Quig, we’re rooting for you and are so proud of the adventure you have taken on in the name of charity. Well done. Stay safe and we’re so glad you’re having fun along the way! Jennifer- great hearing from you! Slowly recovering from the desert riding- it nearly killed me. Now I’m stronger and we’re doing a lot of laughing and story telling! 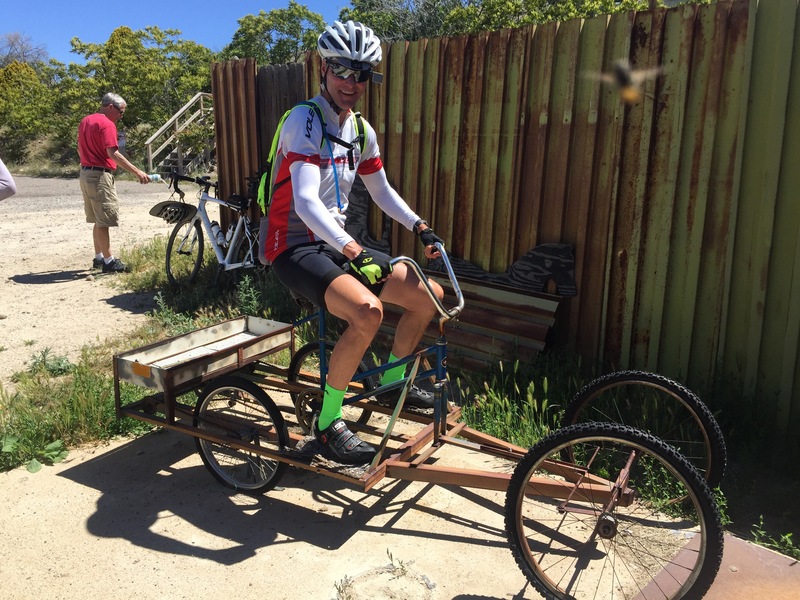 Say hi to big Ed and keep riding with me– need all the encouragement!! Maybe when I’m 85 you can push me around on that bike!! Scenery is beautiful but then I have always liked the desert and pie for breakfast is right up my alley! I’m jealous you guys can all eat pie in the morning and be skinnier at the end of the day!!! Sounds like everyone is doing well for a change. Stay safe. Have fun.